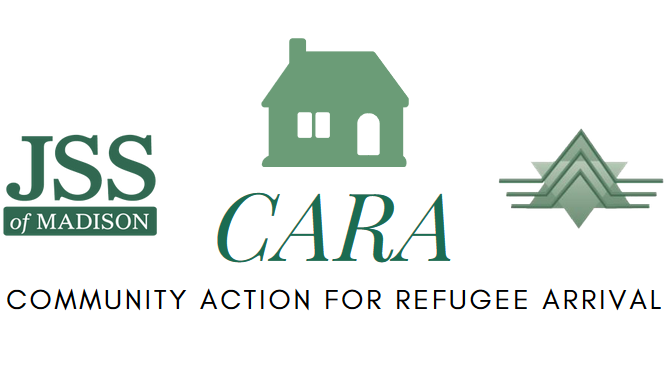 JSS is currently initiating a new program, Community Action for Refugee Arrival (CARA). Over the last nearly a year and a half since JSS restarted its refugee resettlement program, we have had dedicated volunteers who have prepared homes, meals and basic necessities for our newly arriving families. This is hard work that happens with little advanced notice. The CARA program, in which Congregations and other community organizations volunteer to partner with our resettlement staff to do the pre-arrival work, is a way for us to share the burdens and privileges of preparing for new families while harnessing the power of existing community organizations. If you know of a community group or organization that would like to become a CARA team, please reach out to Becca, our Resettlement Coordinator, at becca@jssmadison.org. Older adult woman looking for a friendly visitor for conversation. She has been an active community member and volunteered for years at various senior programs, community centers, and schools. She loves music, travel and languages. She shared that she speaks, English, Yiddish, Hebrew, Spanish, French, Arabic and German. Visiting times are flexible. Do you like shopping? Looking for a companion to go for groceries and miscellaneous items. At least once a month – adaptable to your availability and schedule. You can extend independence for a number of community seniors – occasional help with tasks around the house and apartment, and/or transportation for errands. Contact our volunteer coordinator, Paul Borowsky at (608) 442-4083 or paul@jssmadison.org for more information about volunteer needs and opportunities. Drivers Needed: Help people remain independent! Provide rides to clients for appointments and other destinations on an as-needed and as-available basis. Requires copies proof of insurance and driver’s license plus a driver’s record check, done at our expense. Designated Shopper: Help people remain independent by providing assistance and companionship by going shopping or running errands with them. At times, clients may also need someone to pick up groceries or other items for them when they are not able to be accompanied. Back-up Volunteer Photographer: Take photos at JSS events which will be used for promotional materials and social media. Bikur Cholim/Friendly Visitor: Opportunities to visit with people in rehabilitation, hospital, or memory care. These visits can be made when convenient for you. Computer/ Odd Job Help: Elderly and others looking for some help and support with doing small jobs – changing light bulbs, fixing loose hinge, etc. Help also needed to operate and learn basic computer tasks and general electronic devices such as television and remote controls. Volunteer at holiday, social events, and Oakwood Shabbats: Help the residents of Oakwood Village welcome Shabbat one Friday per month from 3:30p.m.-4:30p.m. Seat guests, pour wine and juice, and distribute challah, interact with the residents of Oakwood Village and their families. Oakwood Village is looking for volunteers currently to help with Shabbats. Please contact Paul Borowsky if interested. Please stay tuned or call Paul at (608) 442-4083 for updates regarding other holiday opportunities including Menorah delivery for Hanukkah. Near Westside single parent of child with intense emotional and behavioral challenges seeks assistance with (1) yard and garden work and (2) small home repairs. This parent is hard working in the field of social services and is dedicated to prioritizing the needs of her two children, which means that attention to the house/yard is lacking. The following are project-based requests – not ongoing. Please consider volunteering time or funds to weed and prune garden beds. It would be great to gather a small group of people to take a Sunday (or weekday) to pitch in and create beauty from the chaos. Home repairs include stair rail, window blinds, curtain mount, door frame trim. Please consider volunteering time or fund a contractor to improve safety in this family’s home, which could likely be done in a morning or afternoon. Your assistance would provide great relief to mom, and she would be extremely grateful – as it is difficult to face the overwhelm of upkeep in the face of her family demands. In addition to our previous opportunities, we now have additional volunteering needs with seniors! We are looking for someone strong to help a senior to move boxes from one room to another. It should be about 2-3 hours. Keep checking in to see our volunteer opportunities! We are looking for volunteers to help with packing, shopping for a car and moving a couch. We have a client who needs to buy a new car, something inexpensive and efficient and we are looking for someone who knows cars to help with this process. In addition, we need lots of help packing, and also help moving a couch. Be sure to keep checking our blog for further Volunteer Opportunity Updates! All of these will take place in the JSS conference room and snacks will be provided. Donate to the newly arrived families. See this link for current needs: http://www.signupgenius.com/go/4090445aca92aabfb6-jssrefugeeasylee.You can also use this link to donate toward helping pay two months of rent for each family. The JSS team and board have decided that we want to raise these funds to help the families a bit longer while they get acclimated.As part of this, we plan to cover two months rent for each refugee family that we resettle. The donations that we receive from the community will help us to reach our goals. Advocate for Refugees by calling your senators and representatives to show your support for the federal refugee program. See details here “How to Stand Up and Fight Back for Refugees”. Working with a senior on planning, cooking and organizing meals, so that all she needs is to microwave them when she needs to eat. Keep an eye out, there will be more coming soon! Many people have been asking, “How can I help?” We’ve put together a list of opportunities that will really have a significant impact on the lives of our new community members. Please take a look and contact Becca or Paul if you can help us. We have four families in Madison already, and it now looks like there will be more on the way.With the newest executive order on hold, the State Department is actually picking up the pace of moving refugees to the United States. We need your help to be ready. Thank you to everyone working with JSS and the new families and for making them feel welcome.